WRAPUP:? Another great roadtrip!!? 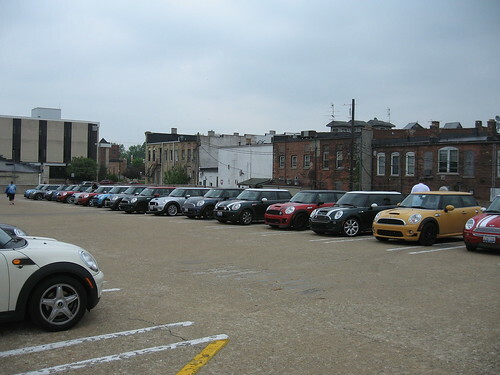 We had 20 MINIs in attendance on a chilly but nice day.? After a late start we headed out to Monroe for lunch.? Their Chili festival was in full force in the town square.? Then we took off on the long?twisty route to New Glarus.? We saw the amazing fall colors, some wild life, animal sculptures, and lots of fun?roads.? We made it to?the New Glarus Brewery in time for a quick tour and?a beer stock-up for those that had extra room in their?trunks.? Huge thanks to Paul and Barbara for all the route planning, and leading and pacing the group!! Please send links?of photos to steve@chicagominiclub.com , and I will add them here. WRAPUP Day#1:? Fantastic weather brought out a bunch of MINIs?for?new swaybars, springs, spark plugs, battery’s and temprature sensors.? Nathaniel from Motoringfile?hosted the?workspace, and Chad from Motoringfile and Detroit Tuned provided the work, and answered lots of questions.? There were soft drinks, snacks,?cake-cookies, hot-dogs?and even free bacon.? Several people stopped by to say hi and watch the work, and we?also got to watch Nathaniel fabricate parts for his?motorcycles.? More action to follow?on day two. Day #2😕 The action continues.. a turbo oil line replacement, supercharger pulley, oil hange, sparkplugs, tire roataion and exhaust install.? Lots of work, no free bacon. Huge thanks again to Chad and Nathaniel!! We’ve updated our plans due to lack of hotel room availability. Please see http://chicagominiclub.com/2012/08/30/wisconsin-overnighter-2012/ for new details. Garage and Graphics day interest? UPDATE: 09/05/2012:? It is time to get all the work locked in and planned.. Please contact Chad at chad@detroittuned.com?for Garage work, or Todd at todd@toddsmods.com for Graphics to make sure the work you’d like done can be scheduled. ?The location?is not locked down yet, but will be?in the near north suburbs. We have a chance to get a couple White Roof Radio?personalities in town for a combined Garage Day and Graphics install day. We are checking to see if there is enough interest to make this event happen..